The Concept of Managed & Unmanaged Solutions was introduced with MS Dynamics CRM 2011, as a simpler way to package crm customisations and deploy to multiple CRM environments. This would simplify the release process and enable Microsoft Partners to utilise XRM to deliver ISV Solutions for CRM. This allowed customers to easily install solutions from third party vendors allowing to easily import, update and maintain CRM customisations. Prior to this customisation were migrated in the same state as they were in development and which sometimes led to customisations being overwritten or corrupted by the end user, effectively breaking the solution. Managed solution helps to preserve the ISV solution in the state that it was released in as well as the Intellectual property of the ISV to a certain degree. This secures the solution in the Target / Production so it keeps the solution feature working and prevents end users from breaking it. Therefore it is maintainable. Solutions are additive, no build in feature to removing managed customisation without losing your data unless a holding solution is used. 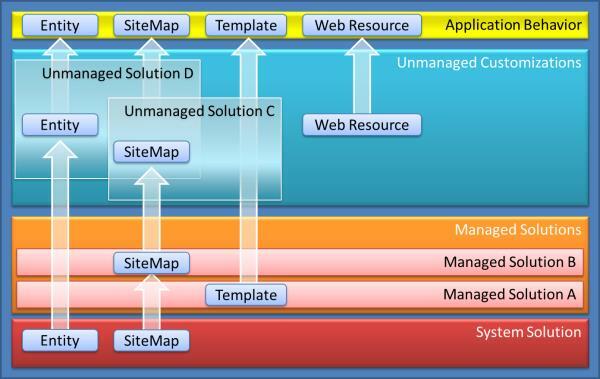 A solution component needs to belong to either a Managed or Unmanaged Component, Cannot be a Mixture of both! 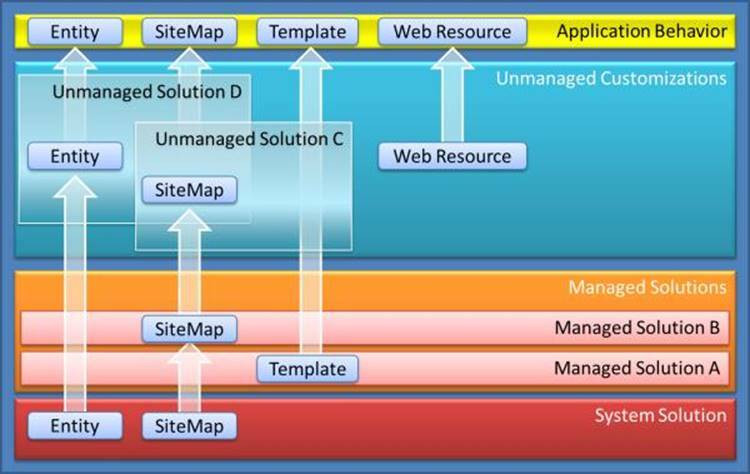 Components in the unmanaged solution layer cannot be updated by a managed solution. <! [if !supportLists]>· <! [endif]>You cannot Directly Edit the Components within a manged solution. 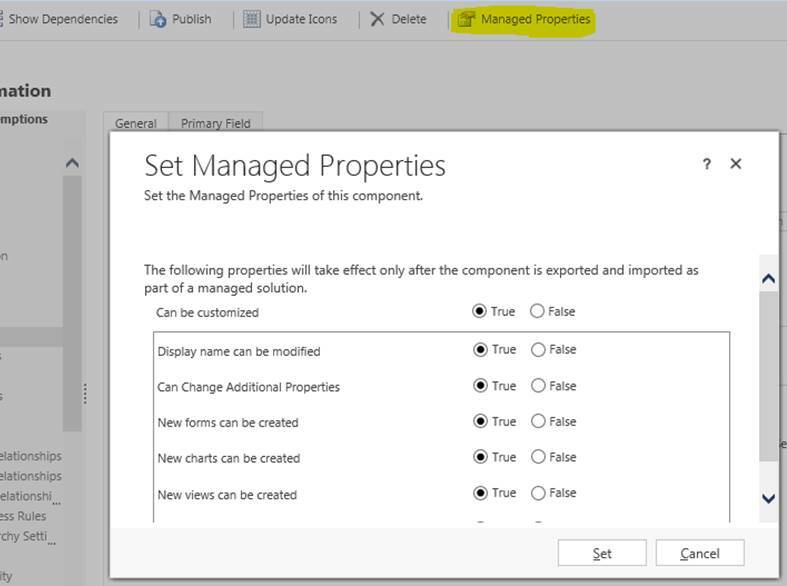 If the Managed properties for the solution components are set to allow customisation, you can edit them in the Customisation Areas (Default Solution) or from another managed Solution. This is useful during upgrades when you may require to make some changes to resolve an error. Maintain customizations (recommended) – This option maintains any unmanaged customizations performed on components, however some of the updates included in this solution may not take effect. Overwrite customizations – Overwrites any unmanaged customizations previously performed on components included in this solution. All updates included in this solution will take effect. Using this option may become useful when investigating conflict issues to establish if the user has applied any conflicting changes to the solution. They should perform an backup export the existing unmanaged solutions before doing so to re-apply if required. The solution publisher for a managed solution plays an important factor when releasing an update to your managed solution. Using the same solution publisher you can create a new managed solution to update a managed solution you previously released. Define Integer Range for Picklists/ Optionsets. Components in managed layers will be owned by the solution publisher. Publisher owns the component, not the solution. Components with same name and publisher will be considered the same thing. Removing a solution does not remove a component when it is referenced by another solution using the same shared publisher. Incrementing the version number will create a new managed layer for the solution above the old layer. Can become misleading, as it suggests that the hotfix can be uninstalled or deleted which is not necessarily true due to the additive nature of the platform. Creating a new solution with a different name and same publisher, will appear to work until the next version of the solution is deployed. Selecting the option to import without overwriting will import the new version of the core solution within a layer directly above the previous version of the core solution. This will be beneath the solution containing the hotfix, which therefore may result in configuration and customization changes not being surfaced. As discussed above, since solutions are additive in nature we need a way of removing a managed solution component after has been deployed without losing our important data and customisations in the process, because uninstalling managed solutions will result in losing all the data stored in the attributes. However there is a technique to achieve this by using a ‘Holding’ solution. Create a temporary ‘Holding’ managed solution for the customisations you want to keep using the same publisher, but with a Unique Name. This is so the new solution contains the customised components at a separate managed layer, so when you do delete the original managed solution containing the field you want to remove, you will not lose the data for the remaining objects. You can use xrm toolbox will be able to copy all the components for you, eliminating the risk of missing any components. Now Import the holding solution into the target, and then delete the old solution which contained the fields you wanted to remove. This deletes the unwanted managed components while the “holding” solution prevents the wanted customisations from being deleted. If you need to keep the original name of the Managed solution you just need to Import the new version of the managed solutionand delete the “holding” managed solution This will allow you to keep your Managed customisations without losing the data and customisations you want to keep. Understanding the mechanics behind Managed and Unmanaged solutions is a very important aspect to solution development and release management which is often overlooked, and Managed solution is Whether you choose managed or unmanaged in your production should be based on how your organisations IT infrastructure is setup with Source Control and TFS as managed solutions will require a robust release process with a lot more considerations to solution merge behaviour, but provides a way to easily remove your customisation if done correctly without causing dependencies. I say this because the forums are full of users struggling to remove managed customisations for various reasons. Unmanaged solutions do not require this level of robustness in the release process, and also provides the flexibility to perform snapshots of the production to resolved blocking issues. Your organisation may decide to deploy unmanaged solutions if they feel at risk of losing business critical data because unmanaged solutions can be easily uninstalled in error, or they may not have the release process maturity in place, they could also be expecting to make changes the deployment such as migrate from on premise to online etc. In such scenarios deploying unmanaged solutions have their benefits, as they have the option to switch to a managed deployment in the future wheras it is a lot more difficult vice versa once you release as Managed you cannot covert it back to Unmanaged in your production without considerable rework. The post Managed Vs Unmanaged Solutions appeared first on Microsoft Dynamics CRM Consultants UK.